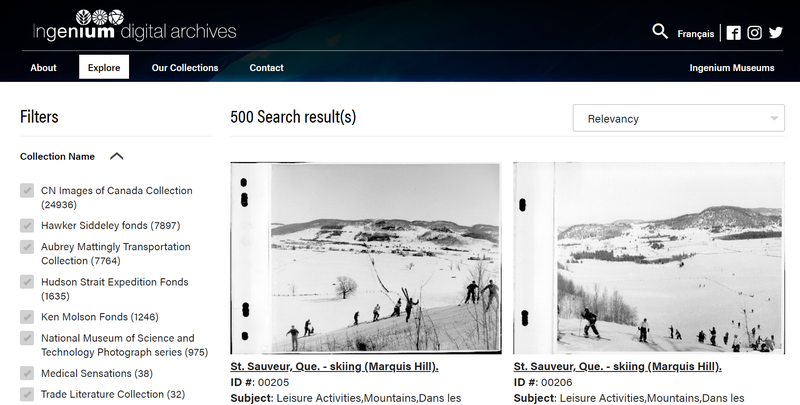 Screen shot of Explore page on Digital Archives' one year anniversary. Ingenium’s Digital Archives portal is now officially a year old! It’s hard to believe a year has flown by since we first offered unprecedented access to the archives of our three national museums. To celebrate this anniversary — and this year’s Archives Awareness Week in Ontario (April 1-7, 2019) —we’ve added three new collections to the portal. I invite you to take a look at the first images from the Hawker Siddeley fonds, the Ken Molson fonds, and the Trade Literature Collection. In the next few days, we’ll be publishing articles on The Channel to introduce these collections in more detail. We have also added some new functionality to the Ingenium Digital Archives. We’re inviting you — the user — to add your own knowledge to our archival records. If you’re looking at an image and have some information to add, please use the ‘Collaborate’ button. A new tab in your web browser will open that will allow you to enter your suggestions. Do you know the person in the photograph? Send us his or her name. Do you know where the photograph was taken? Do you know what year it was taken? Please send us your contributions. Archivists complete the information in a catalogue entry by using the information written on the back of the original photograph, the original envelope, or taken from a photographer’s log or register. When there is no information from the original sources, an archivist can try to supply the information based on the contents of the photograph, or based on some other source of information. Usually this data supplied by the archivist is presented in square brackets, to show that it wasn’t part of the original record. Some series of photographs come without any information — and it would take an archivist an extremely long time to work through each image and supply even the bare minimum of data. Now, our aim is to not let collections sit until an archivist can work through them in the finest detail, but to share what we have through the portal and gradually add to the data over time. Throughout 2018, we published new images from our CN Images of Canada Collection. The most-viewed photograph in the Digital Archives in 2018 was a photograph from the CN collection: X-11026 N.B. – Pit props at Chatham. New Brunswick is strongly represented in our 2019 statistics, which is likely thanks to the interest generated when Ingenium’s Kristy Von Moos posted images on several New Brunswick genealogy Facebook groups. Also popular were images of rail bridges and stations from the Aubrey Mattingly Transportation Collection and scenes from Edmonton and Vancouver. I invite lovers of Halifax, Winnipeg, mountain goats, and skiing to take up the gauntlet in 2019 and find your own bliss in Ingenium’s Digital Archives! We’d also still like to hear about your suggested priorities for digitization! Please reach out to me at: atorrance@IngeniumCanada.org. Adele Torrance is the Archivist at Ingenium - Canada's Museums of Science and Innovation.